Attune Technologies has been altering the conventional lines of hospital governance and management for 70 + clients spread over 7 countries of the world in its 5+ years of operations. Its success is attributable to the strong management team and the 120+ employee bank that works ceaselessly to contribute to its growth chart. The clientele varies from 100 bed small hospitals to 1000+ bed super specialty chains. A demo about the products and services offered by Attune and the company details are available at: www.attunelive.com. Team Attune shall be available at Booth No. 2C8, Hall No. 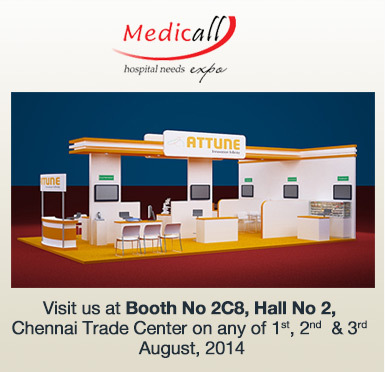 2, at the Chennai Trade Centre between 1st and 3rd August, 2014.